London, UK – 22 June, 2017: Leaking information on mergers and acquisitions (M&A) deals before any public announcement of the transaction added an extra US$21m to the average value of deals announced in 2016 that leaked, according to new research from Intralinks, a business of Synchronoss Technologies, Inc. (NASDAQ: SNCR), and Cass Business School, City, University of London. In addition to evidence of higher valuations for M&A deals that leak, the 2017 Intralinks Annual M&A Leaks Report, published today, found that 8.6% of worldwide M&A deals were leaked in 2016. This figure is unchanged from the previous year (2015) and above a six-year low of 6% in 2014. In 2014, worldwide deal leaks had been on a declining trend for the previous six years, but this trend reversed in 2015 and 2016 – despite the efforts of financial regulators globally in recent years to bring in new regulations to curb deal leaks, and increase enforcement actions and fines for market abuse and insider trading. Of the ten countries with the most M&A activity, the top three countries for deal leaks in 2016 were India (16.7% of deals leaked), South Korea (16.1%) and Japan (12%). The three countries recording the lowest percentage of deal leaks in 2016 were Canada (4.3%), France (4.3%) and the UK (7%). South Korea, Japan, Germany, Australia, the UK and France all recorded an increased rate of deal leaks in 2016 compared to 2015. Countries which reduced their rate of deal leaks in 2016 included India, Hong Kong, the US and Canada. Over the period 2009-2013, Europe, the Middle East and Africa (EMEA) had the highest average rate of leaked deals at 10.4 percent, Asia Pacific (APAC) had the second highest average rate of leaked deals at 7.6 percent and North America (NA) had the third highest average rate of leaked deals at 6.0 percent. 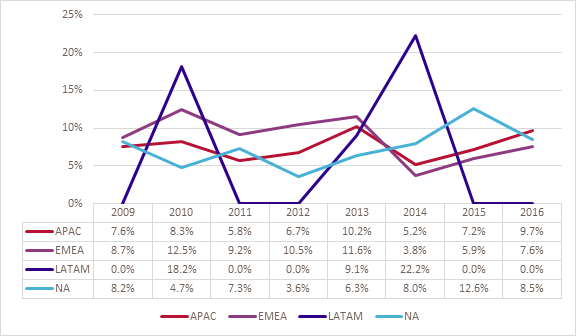 However, since 2014, this trend has reversed: in each of the last three years, the rate of deal leaks in NA and APAC has been higher than in EMEA. The rate of deal leaks in EMEA and APAC has increased in each of the last two years, whereas in NA, after rising each year from 2013 to 2015, it fell sharply in 2016. The APAC region had the highest rate of deal leaks in 2016, at 9.7 percent. Worldwide, the top three sectors for deals leaks in 2016 were Consumer, Retail and Real Estate. The Real Estate sector, which has the highest long-term average rate of deal leaks, dropped to 3rd place in 2016 and was replaced by the Consumer sector, which increased its rate of deal leaks by an astonishing 7.8 percentage points to 15.5 percent. This is the highest worldwide rate of deal leaks of any sector in the past eight years. Worldwide, the bottom three sectors for deal leaks in 2016 were Healthcare, Energy & Power and Industrials. Why do M&A deals leak? As our report shows, there appears to be one clear perceived benefit of leaking deals: higher target takeover premiums resulting in higher valuations, as a result of increased competition among acquirers for targets in leaked deals. This has been true in each of the eight years analyzed for this report: from 2009-2016, the median takeover premium for leaked deals was 47 percent vs. 27 percent for non-leaked deals, a difference of 20 percentage points. To quantify this, in 2016 the difference in the median target takeover premium for leaked deals compared to non-leaked deals was US$21 million, i.e., an average of an extra US$21 million accrued to the shareholders of the targets in deals that leaked. Leaked deals are also associated with a higher rate of rival bids for the target than non-leaked deals: from 2009-2016, 6.5 percent of leaked deals attracted one or more rival bids for the target compared to 5.8 percent of non-leaked deals. There is also evidence that leaked deals have higher completion success rates: In the last three years (2014-2016), the worldwide completion success rate for leaked deals has been almost 5 five percentage points higher than for non-leaked deals. These results could point to one other perceived benefit of leaking a deal – it potentially leads to a better match between acquirer and target. Leaking a deal may flush out the “optimal” acquirer, i.e. the one who has the greatest synergies with the target (and who can therefore pay the highest price, hence the higher target takeover premiums for leaked deals) and therefore also the acquirer who has the greatest incentive to complete the deal. In 2016, the US Securities and Exchange Commission (SEC) brought a record 548 standalone or independent enforcement actions, obtaining judgements and orders totalling more than US$4 billion in disgorgement and penalties1. The SEC also charged 78 parties with insider trading in 2016, compared to 87 parties in 20152. As our report shows, the rate of deal leaks in the US dropped from 12.6% in 2015 to 9.8% in 2016, which may be a result of the SEC’s enforcement strategy. Elsewhere, fines issued by the UK’s Financial Conduct Authority (FCA) were the lowest since the financial crisis, down by 98% from £905 million in 2015 to £22m in 2016.3 But according to the FCA’s own data, it opened a record number of insider trading cases in 2016.4 Hong Kong, which recorded the second highest average percentage of deal leaks from 2009 to 2016, dropped to fourth place in 2016 with its lowest level of deal leaks (10%) since 2012. In its annual report for 2015-2016, Hong Kong’s Securities and Futures Commission (SFC) detailed 107 criminal charges against 15 individuals and five corporations. Total investigations rose by 12% and the number of investigations for insider trading grew by 20% from the previous year5. Is leaking deals becoming less attractive? In 2016, targets in leaked deals achieved a median takeover premium of 38 percent vs. 26 percent for non-leaked deals, a difference of 12 percentage points. This was a 60 percent reduction compared to 2015, when targets in leaked deals achieved a 30-percentage point higher takeover premium. Also, in 2016 the rate of rival bids for leaked deals and non-leaked deals was almost the same (in fact, non-leaked deals had a marginally higher rate of rival bids for the target than leaked deals). So, with the perceived benefits of leaking deals reducing in 2016, and regulatory enforcement against market abuse continuing to increase, could the appeal of deal leaks be waning? For more information on these findings, download the 2017 Intralinks Annual M&A Leaks Report here. M&A transaction data for announced deals during the period 1st January 2009 to 31st December 2016, share price and index price information were sourced from Thomson Reuters. The criteria for inclusion in the sample were that the target must be an entity listed on a public stock exchange, that the transaction must involve the acquisition of majority control of the target and that the target's equity must have a sufficient trading history for its returns to be calculated. The final total sample of deals for the period 2009-2016 was 5,997. A transaction was identified as involving a leak of the deal prior to its public announcement using the event study methodology, which compares the cumulative daily returns of the target in the period from -40 to -1 days prior to the public announcement of the deal with its expected returns. The target's expected returns are calculated using a linear regression model of the target's returns during a “normal” trading period against the market return. A transaction was identified as involving a leak of the deal if the cumulative daily returns of the target in the period -40 to -1 days prior to the public announcement of the deal was statistically significantly different compared to its expected returns, at the 95% confidence interval for a normal distribution - meaning that there is only a 5% probability that the target's observed returns compared to its expected returns would occur in a random distribution of data, i.e. would be due to chance. Unless otherwise indicated, all references to the region or country location of the target refers to the target's primary listing location. The total number of leaked deals for the entire period was 462 out of the total number of deals of 5,997. Cass Business School, which is part of City, University of London, is a leading global business school driven by world-class knowledge, innovative education and a vibrant community. Located in the heart of one of the world's leading financial centres, Cass has strong links to both the City of London and the thriving entrepreneurial hub of Tech City. It is among the global elite of business schools that hold the gold standard of triple-crown accreditation from the Association to Advance Collegiate Schools of Business (AACSB), the Association of MBAs (AMBA) and the European Quality Improvement System (EQUIS). For further information, visit www.cass.city.ac.uk or on Twitter follow @cassbusiness. In 1996, Intralinks, a business of Synchronoss Technologies, Inc. (NASDAQ: SNCR), pioneered the use of software-as-a-service solutions for business collaboration and transformed the way companies work, initially for the debt capital markets and M&A communities. Today, Intralinks empowers global companies to share content and collaborate with business partners without losing control over information. Through the Intralinks platform, companies, and third parties can securely share and collaborate on even the most sensitive documents – while maintaining compliance with policies that mitigate corporate and regulatory risk. Over 4.1 million M&A, legal, corporate development and private equity professionals at 99% of Fortune 1000 companies, investment banks, law firms and private equity firms have depended on Intralinks’ 20 years of experience in helping to facilitate transactions and business collaborations valued at more than US$31.3 trillion across all industries. For further information, visit www.intralinks.com or on Twitter follow @Intralinks. "Intralinks" and the Intralinks' stylised logo are the registered trademarks of Intralinks, Inc.© 2017 Intralinks, Inc.